Shopping for Black Widow Bookmarks? One of the most dangerous and prolific S.H.I.E.L.D. agents, Natasha Romanov, aka The Black Widow, made a name for herself as an unequaled operative in the intelligence world. Originally assigned to the Avengers by Director Fury, Widow has since become a full-time member of the heroic team, putting her unparalleled talents to work in the service of mankind. 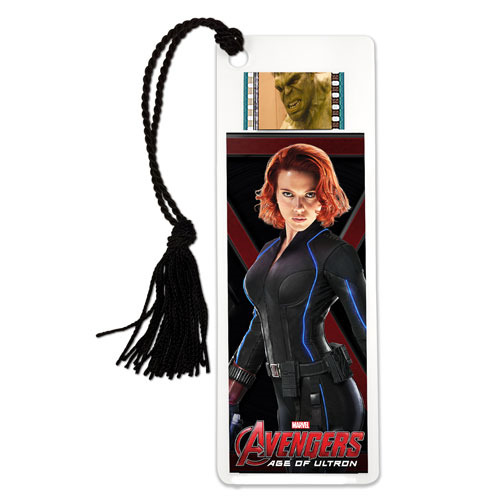 The Avengers Age of Ultron Black Widow Bookmark features custom artwork of Black Widow and boasts a clip of real film from Marvel's Avengers Age of Ultron movie. Measures about 6-inches tall x 2-inches wide.